Classical Net Review - Gardner - Piano Concerto #1, etc. Summary for the Busy Executive: Unexpected depths. More Gardner! Of all the members of the British so-called "lost musical generation" – that is, those who faded into obscurity after World War II (those composers not Elgar, Vaughan Williams, Holst, Britten, Walton, and Tippett) – John Linton Gardner may count as one of the most lost, certainly more so than John Foulds or Patrick Hadley. Yet, paradoxically, he actually has popular hits. Amateurs do his stuff all the time. Much of his music has appeared on CD, mainly on miscellaneous collections, but until recently very few of his more ambitious scores have found their way to the general listener. Naxos and AS&V have allowed a trickle to come through, and the results so far excite me. Gardner became part of the British left during the Thirties and felt the influence of Adorno's musical aesthetic. At the same time, like Aaron Copland, he strongly needed to connect with the general listener. Popular elements like jazz insinuate themselves in his scores. His music resides in Walton's neck of the woods: highly syncopated, rhythmically vigorous, and bright, almost pointillist orchestration, like bubbles in a glass of champagne. In fact, if you played "drop the needle" with things like Gardner's Midsummer Ale Overture or Walton's Capriccio Burlesco, you might have momentary problems sorting one from the other. Nevertheless, significant differences remain, mainly matters of temperament. Walton for me sings more warmly, an open Romantic even in his lighter works. Gardner seems more clear-eyed, not so interested in the transcendent, but delighting in and understanding what's before him – in that sense, a classical artist. Gardner builds ingenious, yet clear structures, easy to follow, if you know what to pay attention to. I've said this in public before and gotten weird looks. I should say, I suppose, "a reasonably-experienced classical listener." If you can follow Mozart, you can follow Gardner. However, most listeners today, even intelligent ones, have very little of this experience. We listen mainly to short song forms – self-contained, with frequent note-by-note repetition so that the main idea sticks. Symphonic music expands and varies its main ideas and requires a larger space to make these ideas felt. In songs, we usually wait for the hook to come around again. In symphonic music, we wait for the new place the hook or hooks (since classical composers generally use more than one) will take us. John Lennon, certainly no dope, once asked his producer, George Martin to give him a crash course in classical. Martin played for him Ravel's gorgeous Daphnis et Chloé Suite #2. "It's nice," Lennon said, "but by the time the end comes around, I've forgotten what happened in the beginning" – a little like complaining that you've forgotten what Picayune was like after you've moved to Paris. 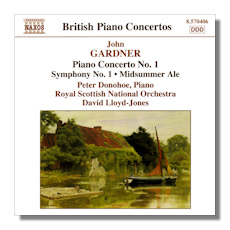 Compared to many classical writers (including the composer himself in his more ambitious work), in Midsummer Ale (1965) Gardner makes things easy. Basically, the overture employs one major idea, or hook, from which the entire overture springs – a do-mi-sol heard right at the very beginning, a seed from which an inventive profusion of melodic lines sprout, taking you to a different place almost every time. A whale of a piece, invigorating. I can't listen to it just once. I have to play it again and again – it makes me feel that good. The piano concerto and the symphony come from a slightly earlier, though nonetheless significant time – 1957 and 1947, respectively. Both show Gardner at his most ambitious, and both constitute slightly rougher going, as if the young composer wanted to show himself capable of high seriousness and thus to be taken seriously. The piano concerto experiments more, using classical structures in a distinctly non-classical way. Indeed, it seems more an exploration of one enigmatic harmony rather than a virtuosic change of key-centers. The chord, heard at the very beginning in arpeggio, permeates most of the score. It strikes me as a tonal response to Schoenbergian atonality. Themes as such become difficult to distinguish one from the other. This is especially true of the second movement, a theme with four variations. Indeed, I'm still not sure exactly what the theme is, although I can make out characteristic intervals. The finale, a rondo, is the most conventional movement; we do hear tonal shifts. Nevertheless, because of these earlier ambiguities, the piece fascinates. The symphony, on the other hand, shows a complete mastery of form and thinking over the long haul. Indeed, this is one of the best British symphonies I know. Don't let the low opus number fool you. After World War II, Gardner withdrew a considerable amount of well-received early work and started from scratch. Even so, he's managed to turn out nearly 250 opus numbers. The score is almost monothematic, growing out of a motto, which of course you hear at the very beginning. Except for the scherzo, Gardner's themes, although one can differentiate them easily enough, have the same general shape, thus pulling the symphony together like steel cable. The first movement – a slow brooder – creeps along for almost twelve minutes without ever bogging down, no easy feat. It's precisely the close-knit relationship among the themes – the surprising transformations as well as a highly poetic and canny orchestration setting off the various parts – that pulls this off. The scherzo relieves the tension and provides a perfect rhetorical break, especially when one considers what follows. It uses two themes, both to my ear tinged with Chabrier-España inflections. Again, the orchestration's a marvel and Gardner's judgment of symphonic time so acute the movement lasts not a note longer than it should. The slow movement more or less repeats the rhetorical strategy of the first, but the main themes apparently differ. That is, the music works toward getting to a climactic statement of the motto theme. Furthermore, Gardner implements this over two movements, rather than just the one. Nevertheless, the composer begins effortlessly to show how one idea morphs into the other. We get ghostly echoes from the first movement, but these don't merely rehash. The new context makes them new again. The finale, a rondo-like structure, takes for its main theme a wired-up version of the motto. The episodes recall earlier movements, and after a buildup, we finally get the full-blown version of the motto before the symphony winks out. This symphony, premièred by Barbirolli, made Gardner as a composer. It led to uninterrupted commissions which allowed him the time to write, even if he still works in relative obscurity. It seems to me that among 250 opus numbers more high-quality stuff should be available. Naxos is just the company to bring some of this to light. These are not easy scores to perform. The piano concerto in particular offers few conventional signposts, and the symphony's first movement has almost as many subtle tempo changes as one by Mahler. Donohoe and Lloyd-Jones navigate the treacherous waters superbly. The Royal Scottish National Orchestra play with bite and conviction. In short, a wonder of a CD with marvelous music (it will probably show up on my best of the year), and it's on bargain-label Naxos besides. What are you waiting for?